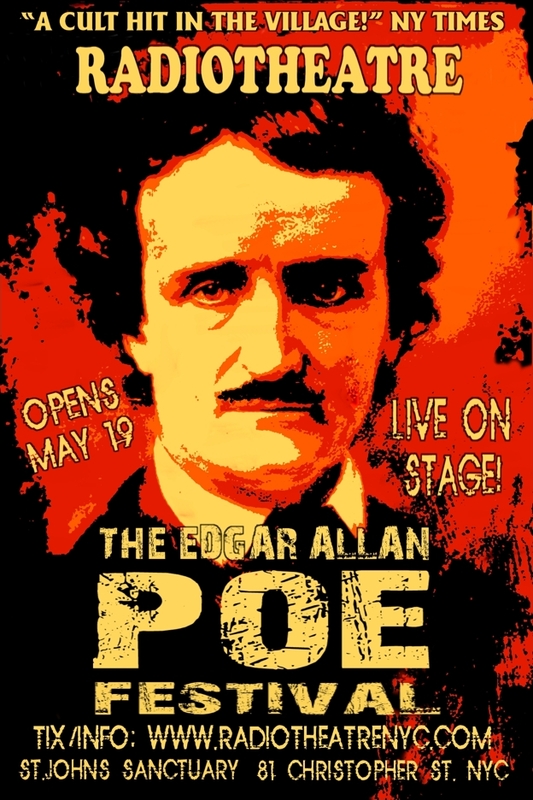 Review Fix chats with Radio Theatre New York City who discusses the upcoming Edgar Allan Poe Festival in New York City. Review Fix: What inspired this festival? Dan Bianchi: Radiotheatre produced SUNDAYS WITH POE in 2009 at a downtown theater. It had a similar format with 20 of his stories I had adapted and each month we performed 4 titles on Sunday afternoons. We sold out for a year with tourists booking months in advance and locals returning for different programs. Not many Off Off shows are able to do that. In 2015, HOUSE OF FEAR published my book EDGAR ALLAN POE ON STAGE a collection of my adapted stories. Now, we are in the 160 years old St.John’s Sanctuary just blocks from where Poe had lived in Greenwich Village back in the 1840s, so, we figured it was time to bring forth the Master of the Macabre again. Review Fix: Why do you think Poe still matters? Bianchi: Every writer in the field of horror literature, film, TV from all over the world will still point to POE as the inventor of psychological horror and mystery, the sort of approach which still fuels most of today’s terror tales in books, games and on screen. His works were filmed as soon as motion pictures were invented! He was also the first American science fiction writer and he virtually invented the mystery/detective genre which inspired Doyle to create Sherlock Holmes some years later. Poe didn’t need monsters or supernatural ghosts…he realized that true horror lies within ourselves. He is the Shakespeare of horror…his work will always be there for future generations to mine for inspiration. Review Fix: Can you explain what RadioTheatre does differently with these classic texts? Bianchi: Radiotheatre is inspired by the Golden years of radio…BUT unlike other radio show groups, RT does not care to re-create a 1940s radio show with old costumes, live foley artist, etc. It is not a play, nor a musical, nor a play reading. It is a performance group much like a musical quartet…with story tellers at podiums using microphones and scripts on stage… but our voices are our instruments and the scripts are like sheet music that is already memorized. However, all that is enhanced by a unique music software created for Hollywood movies that makes Radiotheatre sound like no other live show on stage, large or small. So, we are able to create original orchestral sound tracks played live along with the voices. In this way, we strip down to the basics of theatre…the aural experience which was probably the first theatrical presentation way back when mankind sat in caves around a campfire in the dark. Radio emulated that experience in the 20th Century. It required that the listener participate in the experience by using their individual imaginations to create the visuals in the story. Most theater and film and TV do not ask the audience to participate in that way, so that, too, makes Radiotheatre a unique experience for our crowd…most of whom greatly appreciate to be able to use their own imaginations for a change instead of relying upon directors and designers dictating to them what they should be seeing. Review Fix: Who will enjoy these works the most? Bianchi: We tell everyone in our ads to just bring your imaginations! We have the whole spectrum in our audience…from 12 year olds to those who still remember what it was like to listen to a terror tale in the glow of the radio dial in their dark living rooms…requiring them to create the terrifying visuals in their imaginations. Unfortunately, not everyone has a vivid imagination…they require everything to be done for them as with movies, tv, etc. Can’t help them. But, most people appreciate the experience and stay after shows to express their thanks to the cast, etc. When we tour across the country, audiences are always appreciative. AND, for the POE FEST, we have several college American Literature classes attending, as well as, a visiting New School scholar from Beirut who will be observing our audio process for use in a political theater project. Review Fix: How do you want these productions to be remembered? Bianchi: The main difference with Radiotheatre from all other theatrical productions is our use of this unique music software that virtually creates a movie soundtrack live on stage…for any kind of play. RT focuses on horror, adventure, sci fi because those genres not only have the plenty of aural opportunities…but, while they are thoroughly accepted by film and TV producers…generally, they have been ignored or poorly treated by the Theatre World. In the past, whenever Theatre attempted to present those genres…they tried to compete with $100 million movies…which is a lost cause, or, they make fun of the genres or turn them into dancing musicals.. We say…why not create some serious horror that big movies and Broadway shows can’t produce…that only live intimate theater can present properly and sincerely…and, most importantly, at a fraction of the cost? Yes, every low budget theater company can easily do what we do…if they knew about it. No costumes, no sets, no makeup, no props, etc. And, yet…Radiotheatre can create KING KONG wrecking NYC, aliens invading the U.S. in WAR OF THE WORLDS, Dr. FRANKENSTEIN creating his monster amidst fog and lightning and machines exploding, etc. like no other live production. BUT, in regard to the POE stories…this audio technology allows us to delve into the inner mind of a psychotic murderer as he talks to himself…and to us in the audience, as if we are not only there in the room with him, but, in his demented mind, too! Microphones allow the actors to whisper if need be and people in the last row can hear quite clearly…as if they are wearing giant headphones! Traditional theater can’t do that without an actor projecting loudly across the rows. We’ve made theater more intimate than ever before. I think most of our audiences will remember experiencing Radiotheatre, especially those who frequent traditional theater and will talk about it in years to come. I hope that other theater companies will learn to use the same prize winning software too…and create musical sound tracks for any play, from Tennessee Williams to Shakespeare. Perhaps, RT has created a process that may revolutionize low budget stage production. Review Fix: Bottom line, why should someone come to the festival? Bianchi: We introduce each of the 16 stories with a bit of historical background, so we hope that the audience can learn something about Edgar Allan Poe and where he belongs in the history of world literature. Of course, our main goal is to scare the hell out of people…in a good way! Again, we have no idea what each individual sees in their mind’s eye during each frightening story…so, as we always say, bring your imaginations!